The Consul expressed his gratitude to the Crimean Tatar Association of Cultural and Mutual Aid for the active position in supporting Ukraine. 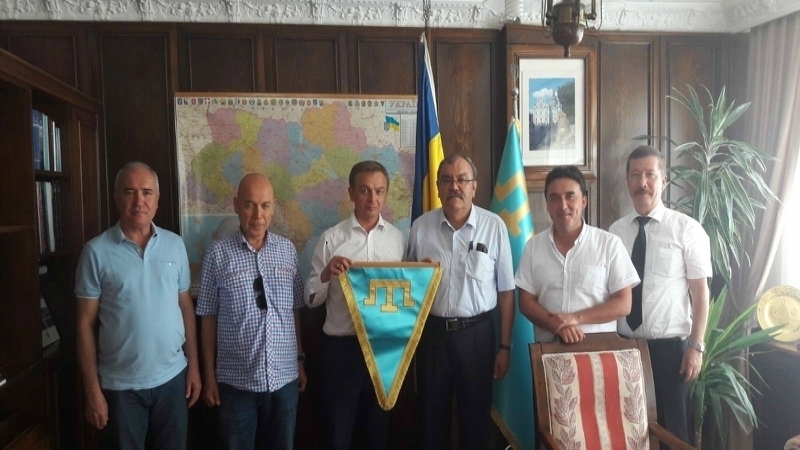 On July 26, Consul General of Ukraine in Turkey Aleksander Gaman held a meeting with representatives of the Crimean Tatar Association of Cultural and Mutual Aid in Istanbul, led by the Head of the Association Dzhelal Ichten, Ukrainian Foreign Ministry press service reported. Cooperation of the Crimean Tatar dernek with the Consulate General and the Ukrainian Diaspora in Turkey, organization and holding of general events were discussed during the meeting. Aleksander Gaman also informed representatives of the Crimean Tatar Diaspora on efforts and steps of Ukraine to restore the territorial integrity of the state and to ensure the rights of Ukrainian citizens in the temporarily occupied Crimea. The Ukrainian Consul General thanked the Crimean Tatars for their active position in supporting the territorial integrity of Ukraine and liberating the Autonomous Republic of Crimea and the city of Sevastopol from Russian occupation. Crimean Tatars gave a pennant with a tarak-tamga to Alexander Gaman as a gift.